Members of the Kyttle Community 4-H Club of the Millville area display some of the items donated Tuesday evening to the ARC by the 4-H Club. 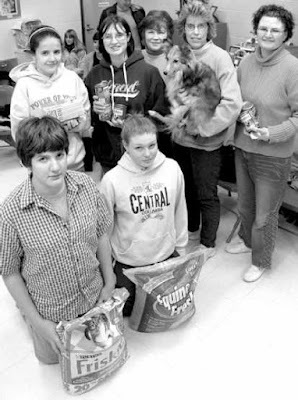 The club collected pet food and supplies and donated them to the center at its meeting Tuesday evening at the Bloomsburg YMCA. Eric Robbins and Sarah Shultz. Ronda Shultz, 4-H Club leader.